We had a sick little toddler on our hands this past Saturday. My poor little boy snuggled up to me as close as possible all Friday night, constantly telling me "I want to be in your arms." Break my heart! He had a fever & kept complaining about his tummy hurting, so of course we tried to do anything we could to help. He wasn't eating or drinking much, so I decided to make him a special cup of tea. He was overly excited about having his own mug and made sure to tell us that the tea would be hot so we would have to cool it down. Even sick, Liam is always on point! So I brewed some ginger tea, then added a bit of honey and the extra special ingredient...breastmilk! Oh the benefits of having a nursing baby again! 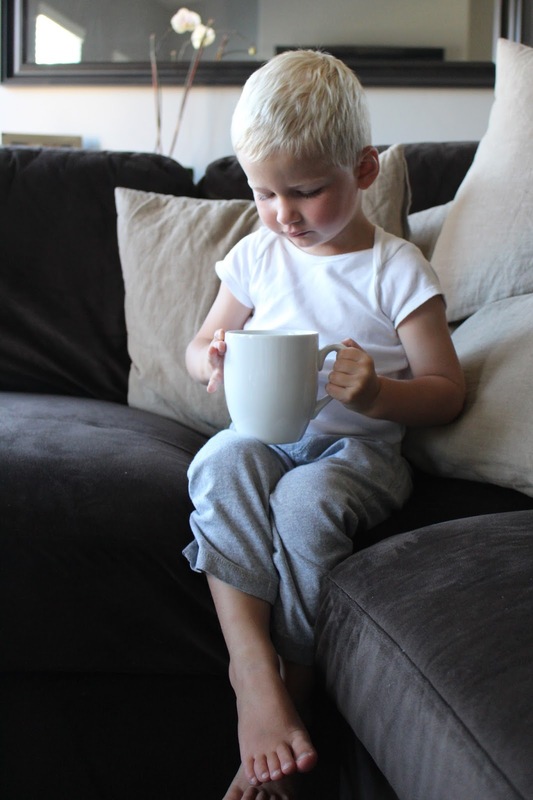 Watching him crawl up onto the couch with a huge mug in his tiny hand was one of the cutest moments. 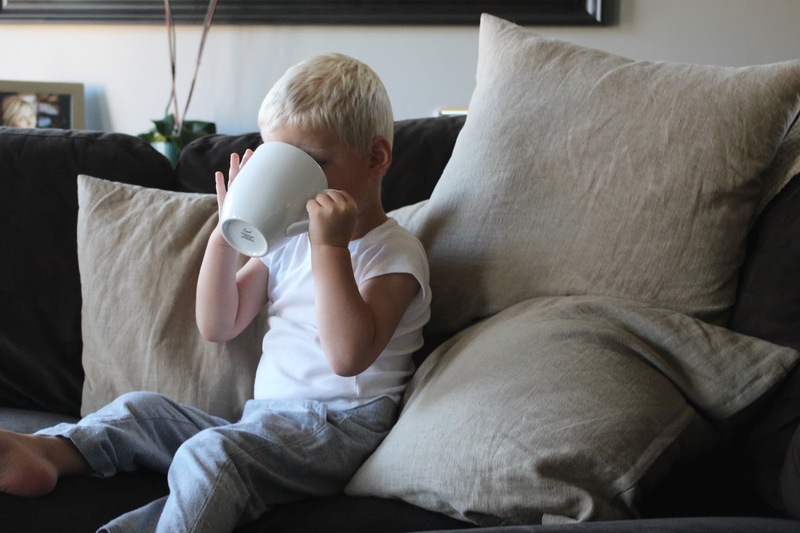 It's incredibly hard to see your child sick, especially when you feel helpless. So I was excited to see a smile come across his face as he sipped his tea just like a little man. Unfortunately, he literally only sipped on it. And only a few sips at that. While it tasted absolutely delicious, he wasn't that into it. So instead, we took a bath together in "Mama's big bath"! This worked out perfectly since I was in desperate need of a shower/bath as was Finn. So baby brother joined us as well and even had a little snack in the tub. It was special moment. Crowded but special. It's not how I pictured we would be spending our Saturday, but it was still full of moments that I will cherish. Sometimes a lazy day with family is just what everyone needs! I hate when they are sick! It's so hard to watch them in pain. But the extra cuddles are nice and what a feeling to be the only one they want to be comforted! Feel better Liam! Poor guy! I hope Liam is feeling better! Such a beautiful picture! And breast milk in the tea? Sneaky sneaky! So genius though! Hope Liam is on the mend already!!! Yes, sneaky & genius. You will have to try that trick next time Lily is sick! Sometimes the most unexpected moments are the most special. So special you got to be with both of your boys at the same time. Aww, hope he is feeling better. He looks so cute with his mug! Oh, poor baby. 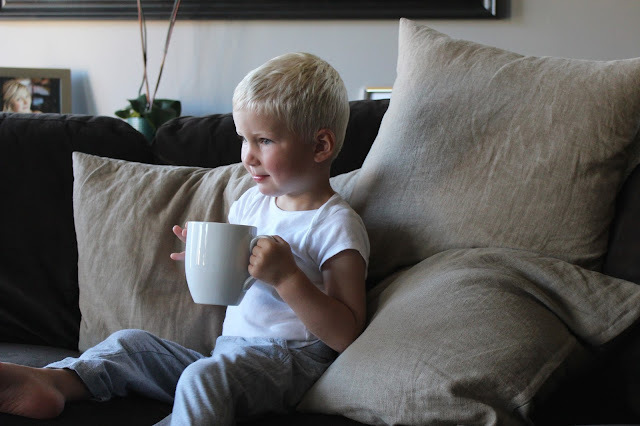 That giant mug in his little hands is just too cute. Hope he's feeling better soon. And aren't family baths the best? I still take baths with our two kids. Definitely crowded, but so much fun! Oh sick babies are the worst!! SO heart breaking (but I do love how it turns them into our little babes again!) This is a genius idea to give him a special drink in a special mug... 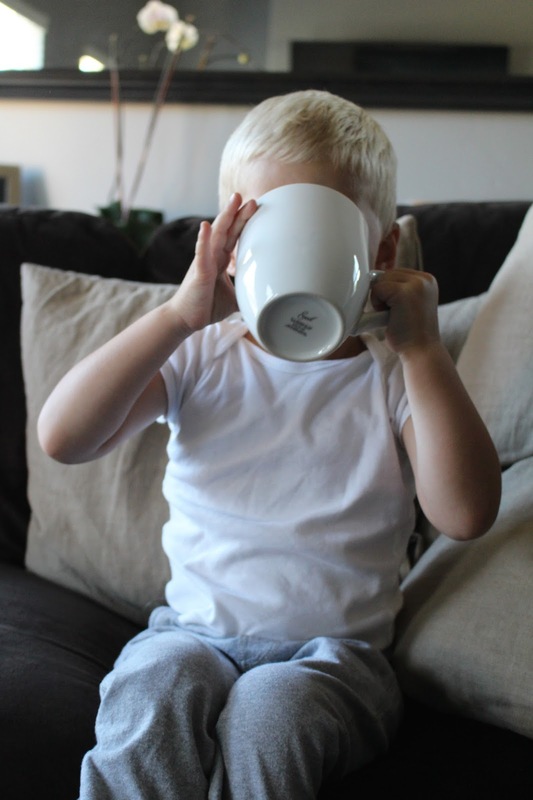 I will have to remember the mug idea next time Mia is sick (and using the breast milk as an added benefit when little brother arrives) I think she will LOVE it! Aw sick little ones are the most heartbreaking! Hope the snuggles helped him feel better! And that is a precious moment with your boys that you captured! Those are the moments to treasure! It was heartbreaking. But that bath together with my boys was pretty incredible!